Akeem Yakubu is an interesting right-winger, playing for Warri Wolves FC in the Nigeria Premier League 2012. Yakubu started the season at Rangers International FC, the current league leaders, before me made a surprise move to Warri Wolves FC in February 2012. Yakubu had made several impressive performances for Rangers and he has already forced his way into the starting eleven of his new club. My first record of Yakubu is from the season 2007-2008 when he played for Dolphins FC at second level of Nigerian football. In 2007, Yakubu was training with the Nigeria U-20 national football team, suggesting that he is born in 1988, 1989 or 1990. In 2008-2009, Yakubu was part of the Dolphins FC team that won promotion to the Nigeria Premier League. In 2009-2010, Yakubu experienced relegation with Bayelsa United FC. 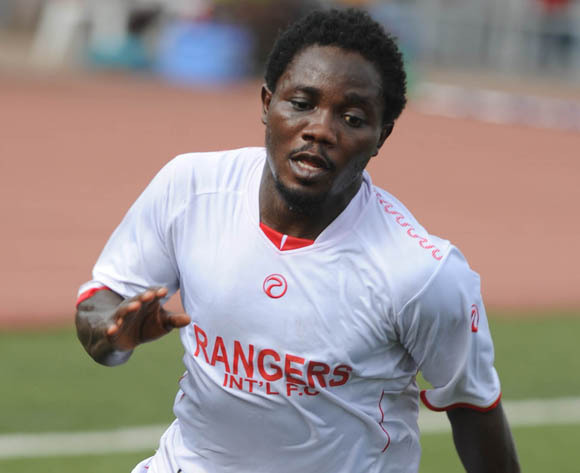 He joined Rangers International FC before the Nigeria Premier League 2010-2011 and became an established member of the team. Yakubu is not a natural goalscorer and as far as I know, he has scored two league goals during his 2 1/2 seasons at top level in Nigerian football. The date of birth of Yakubu is unknown. According to 2muchsports, Yakubu is born 12.08.1990, which could very well be correct. My contact in Nigeria, Uche George, has seen Yakubu play a couple of times. George describes Yakubu as a player with great speed, backed with a fair amount of dribbling. He is not a showoff, suggesting that he uses his dribbles with effect. Yakubu plays predominantly from the right-wing, but he’s also comfortable coming in from the left. He has a knack for cutting into the middle from the flanks and taking a shot at goal, quite like Arjen Robben does, although George thinks he lacks some flair and finesse. George has observed that Yakubu is fleet footed, but thinks he is more comfortable with his right, even though he has scored goals with his left from outside the 18 yard box. Sometimes last season, George observed that Yakubu gets indecisive with the ball at his feet. He could do himself a favour by attacking into the 18 yard box more often, because he has the ability to do so, but hesitates at times. A little selfishness wont hurt, as long as he does not loose the ball. the game. George thinks that although Yakubu is technically adaptable, he has to improve on his tactical awareness.